JUSTKIDS is happy to announced the second edition of Unexpected which is taking place in North West Arkansas, from September 1-11. The event is produced by 64.6. The artist line-up, curated by JUSTKIDS, includes Alexis Diaz, Okuda San Miguel, Guido Van Helten, Jaz, Pastel, Faith 47, Bordalo II, Cyrcle and returning artists D*Face and Maser. “We had the pleasure of bringing exceptional artists last year and the impact and response of Fort Smith was very positive. We are coming back with a brand new program, including a variety of Art interventions such as installations, videos performances and murals ” says Curator Charlotte Dutoit from JUSTKIDS. Centered around 2 weeks, Unexpected continues their mission to bring high quality urban and Contemporary Art to Arkansas with exhibitions, residency programs, projects murals, indoor and outdoor installations and videos performances. 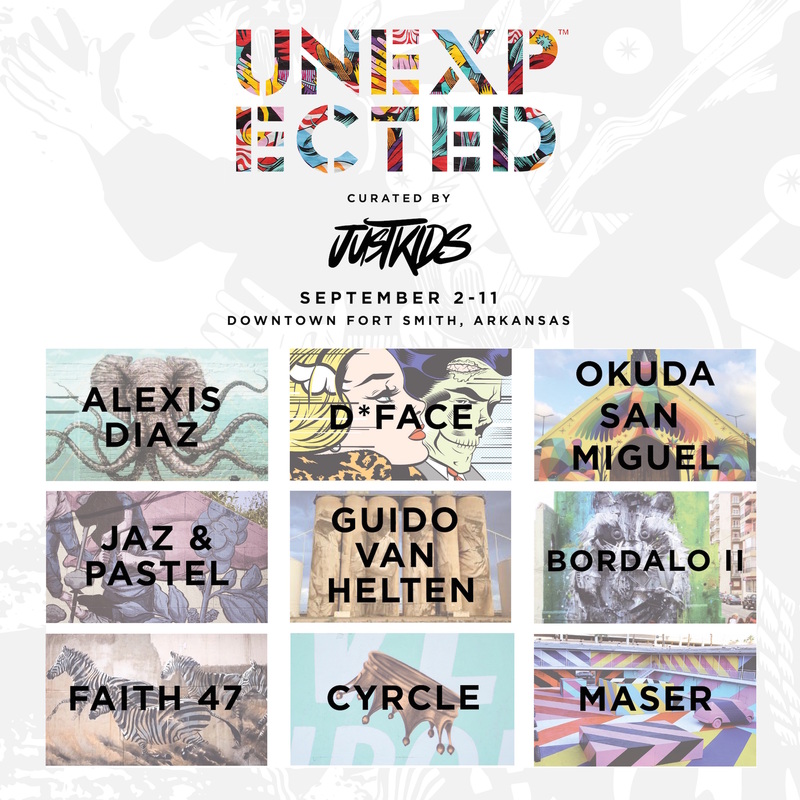 While Alexis Diaz will open The Unexpected with a mural in Fayetteville, the main event will take place in Fort Smith from September 2nd to 11th bringing together ten International Artists to the historic downtown., which was drastically changed last year for the first edition by Artists like Vhils, D*face and Roa among others. Fort Smith was formerly a real western town on the border of the lawless Indian territory and has a rich history of legendary heroes and outlaws such as the Jesse James Gang, Billy the Kid and The Bandit Queen Belle Starr. A one of a kind inspiration for the participating artists. Thursday, September 1st will be the kick off celebration at the Windgate Art and Design Center with the opening of Maser’s installation entitled Argon, an immersive sensory intercative three dimensional installation. The exhibition runs at the University of Arkansas Fort Smith, Windgate Arts and Design building until October 1st. 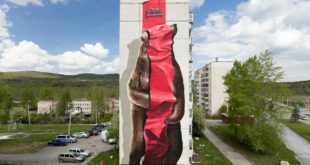 Guido Van Helten will be painting 3 grain elevators from OK Feed Mills, Portuguese Artist Bordalo will build an installation made with trash in a park on the main Downtown Avenue while Cyrcle will create an indoor video performance at the Unexpected HQ. London artist D*Face will be painting an iconic building right at the bridge that goes to Oklahoma and Spanish artist Okuda will wrap up an entire house at the enter of the Town. Faith will be painting a mural with her signature wild inspiration straight from her native South Africa, and Argentinians Jaz and Pastel will collaborate on a giant mural on a historic building. JUSTKIDS is a dynamic interface that conceive, produce and promote comprehensive art projects on an international scale with some of the world’s most engaging artists, curators and strategic consultants. Founded in 2014 JUSTKIDS supports a diverse team of inspirational pros and upcoming talents to meet the demands of a constantly evolving audience, delivering public Art, gallery shows, Artist tour and branding, offering new consumer experiences with top tier visual artists. JUSTKIDS is the creator and producer of some of most innovative large scale art events and the consultant for some of the leading Art institution and lifestyle brand.